Lenin Moreno won Ecuador’s presidency in April of 2017 by running as staunch loyalist to former president Rafael Correa who was in office for ten years. 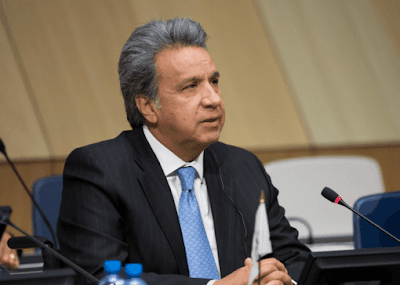 Very soon after Moreno was inaugurated in May of last year it became obvious that he was intent on discarding the promise of continuing the “Citizens Revolution” – the central promise of Moreno’s campaign. He began shifting policy sharply to the right with the crucial support of big private media that had always attacked Correa. Moreno immediately made changes to public media to mute criticism of his about-face. Alianza Pais (AP), the political party founded by Correa, was very recently put under control of Lenin Moreno by electoral authorities. Correa and key allies withdrew from AP and are in the process of founding a new party. Correa is campaigning for a “no” vote on three of seven questions that Moreno has put before voters. Moreno is campaigning for a “yes” to all questions. The referendum will be held on February 4. Correa and his allies are, to be exact, pushing for a “no” vote on questions 2,3 and 6, but have been focused mainly on questions 2 and 3 because both questions were found to be unconstitutional in a lengthy report written by a Constitutional Court judge, Tatiana Ordeñana Sierra, who was assigned the task of determining the constitutional validity of the questions. The court’s approval of any referendum question is a constitutional requirement. I’ve explained in another piece that Moreno, after publicly “demanding” that the court make a “favorable ruling on all the questions” (no doubt after getting wind of the contents of judge Ordeñana’s ruling) by-passed the Constitutional Court entirely using ridiculous arguments. Explaining question 3, which is very complex and has crucial details buried in an annex, has taken up a lot of Correa’s time, but he has never failed to explain that question 6 shows that Moreno is putting the greed of elite speculators above the needs of the vast majority of Ecuadorians. Question 6 proposes the elimination of a land and real estate speculation tax dubbed the “plusvalia” law. On January 21, in a TV interview broadcast around the country, Moreno claimed that the plusvalia law has ruined people – literally “put them on the street” – by causing a slowdown in the construction industry. Two of the three journalists present when Moreno said this were from right wing networks (Teleamazonas and Ecuavisa). One was from public media (EcuadorTV). None of them challenged Moreno’s claim, or mentioned that Moreno had praised the plusvalia law as a presidential candidate. It wasn’t that the journalists were shy about challenging Moreno during this interview or constrained by any need to feign objectivity – a point to which I’ll return. Ecuador’s big right wing outlets led the charge against the “plusvalia law” when it was introduced in 2015. The law actually made drastic changes to an already existing speculation tax. The elite backlash against the plusvalia law was so fierce and effective that Correa withdrew the law and spent over a year regularly countering the media campaign against it. His government made an online calculator available so that people could see exactly how the tax worked, and he frequently worked through examples on his weekly TV show. You could enter the price you paid for the property, the price you sold it for, and the number of years elapsed between purchasing and selling. You could also enter the value of improvements you made to the property which reduces the value of the “plusvalia” tax owed. The tax only affects those who make “extraordinary profits” on the sale of land and real estate. Extraordinary profits are defined in the plusvalia law as a rate of return greater than the average rate interest rate reported by the Central Bank for a one year loan. Presently, if you sell a property after any period of time, made no improvements to it, and make a 7% per year profit you would not pay the tax. A 7% rate of return would double the price of a property in 10 years. However, if someone bought a property for $400,000, added no value to it, and sold it only a year later for $800,000 (which is a 100% rate of return) then the tax would be $271,110 leaving a profit of $128,890. Under the old law the tax would be only $38,000. I’ve used nominal rates of return in the examples above but Ecuador’s inflation rate is low. It has usually been between 2 -4 % over since 2004. Inflation plummeted after Ecuador adopted the US dollar as its currency in 2000. Throughout the TV interview of January 21, all three journalists, including the one representing public media, constantly reinforced Moreno’s premise that Correa’s decade in office was a disaster. The “questions” put to Moreno by the journalists usually included mini-rants against allegedly widespread corruption and excessive public spending under Correa. But eliminating the plusvalia law would encourage corruption since the extraordinary profits from selling land and real estate often result from corruption – for example when government officials tip speculators off about where public works will be built. Speculators can then rush to buy up property that only they know will soon spike in value. What about Moreno’s claim that the speculation tax caused a construction industry slowdown? If there were any truth to that then it would mean that Ecuador’s construction industry is very dependent on land and real estate speculation – a serious problem that should be solved through measures like the plusvalia law. It would mean that Ecuador is at serious risk of developing a real estate bubble. Such bubbles crashed economies all over the world in 2008. They caused a global recession whose epicenter was a real estate bubble in the United States. Moreno’s claim is, however, incredibly far-fetched. Ecuador’s construction industry, and its entire economy, slowed in 2015 and 2016 because of blows to the economy that the government could not prevent: a deep and sustained collapse in oil revenues (which have often accounted for more than half Ecuador’s export earnings in recent years) caused by the global oil price collapse that began late in 2014; a rise in the value of the U.S. dollar which has been Ecuador’s currency since 2000 at the same time competitors were devaluing their currencies thereby making Ecuador’s exports less competitive and hurting import-competing industries: and a devastating earthquake that hit the country in April of 2016 that killed almost 700 people. The net economic impact of the earthquake impact was to further contract the economy. Moreover, the plusvalia law was passed by the National Assembly late in 2016 and did not come into force until 2017 thanks to the hysterical elite reaction against it. The power of the private media is shown by how hard Correa had to work while in office to counter propaganda spread on behalf of elite speculators. It totally debunks myths about Ecuador’s media having been cowed or silenced under Correa. In any country, but especially a developing country like Ecuador, what percentage of people buy a house to resell it in a year at double or more the original price? It’s the kind of behavior that not even today’s neoclassical economists condone. Adam Smith approved of taxing land speculators heavily. If big speculators were represented in public debate according to the numbers rather than their illegitimately acquired wealth and political power, then the private media’s campaign against the plusvalia law in Ecuador would have been hopeless, and Moreno catering to speculators would be political suicide. But with public and big private media now pushing the same agenda, all kinds of obvious questions and concerns get swept under the rug. In the TV interview mentioned above, none of the journalists expressed any concern about Moreno publicly “demanding” that the Constitutional Court rule the way he wanted, or that he by-passed the court in violation of the constitution – even though Moreno boasted to them that he had deep respect for judicial independence and the rule of law. Their priority was to push Moreno even further to the right. The Teleamazonas journalist asked how Moreno can deliver “change the people want” if he is “still surrounded by Correaists”. She also said Moreno should privatize the public pension system and pursue a free trade deal with the United States. Moreno evaded responding to her first suggestion, and said he was open to the second. The Ecuavisa journalist was the only one to even mention the plusvalia law. In passing she mentioned that the National Assembly could have already eliminated the law and that of course Ecuadorians “don’t want more taxes”. Moreno and the journalists all cheerfully pointed to their interview as a sign of increased press freedom and “dialog”. The whole interview was more like a monologue in support of Ecuador’s elite who desperately want Ecuador’s decisive break with neoliberalism under Correa to be discredited. It’s very important to know that some elements of the supposed “left” in Ecuador have often proved willing to mimic the right. In 2015, in a TV interview on Ecuavisa, Carlos Perez Guartambel, whose name frequently appears in articles disparaging Correa from the left, actually opposed the plusvalia law. From about the eleven minute mark of this interview his entire critique of Correa’s economic policies is a tirade against wasteful public spending and excessive taxes that could have been lifted word for word from any rightwing politician. Carlos Perez endorsed the rightwing candidate Guillermo Lasso during the 2017 presidential campaign. Another organization that is supposedly on the left, the indigenous group, CONAIE, also opposed the plusvalia law. In 2016, CONAIE’s president, Jorge Herrera, opposed the National Assembly finalizing the plusvalia law on the vague grounds “more tax increases are not the answer”. It’s been frustrating to see well-meaning people outside Ecuador taken in by “leftists” like this. A party overly preoccupied with preventing betrayal can end up becoming an isolated sect, but Correa and his party deserve criticism for allowing an opportunist like Moreno into a top leadership position. I explored critiques of Correa’s party with Ecuadorian political activist Wladimir Iza. It is also possible that at times Correa’s fiery temperament needlessly alienated natural allies. However, it appears that the most important criticism, not only of Correa but other left wing presidents in the region, is that their method of combatting the corporate media relied too heavily on having executive power. It was way too easy for Moreno to quickly reestablish elite hegemony over public debate. In fairness though, if breaking that hegemony were easy it would have been done decades ago.